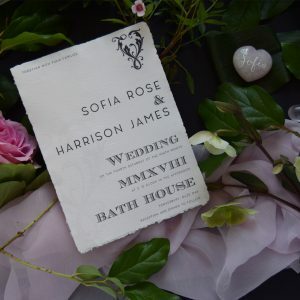 Complete your wedding suite, special invitations, letters or bespoke calligraphy piece with these lovely extra services. 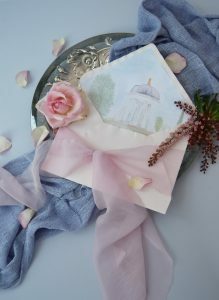 From envelope calligraphy service to watercolour artwork I can create something completely bespoke and unique to you and your style. 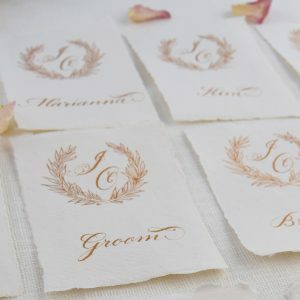 Have your envelopes written by hand in a calligraphy style of your choice, I have a wonderful collection of inks including metallics and can also create custom inks to match your wedding suite or event style. Would you like your envelope, invitation or special bespoke piece finished with a wax seal? I can provide wax seals in different colours and stamps which can be combined with a ribbon, twine or by itself. 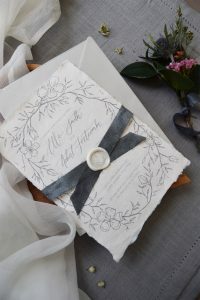 Complete your wedding suite or event invitation with a lovely twine, linen thread or ribbon wrap – create a wow factor and have your invitations wrapped in style. 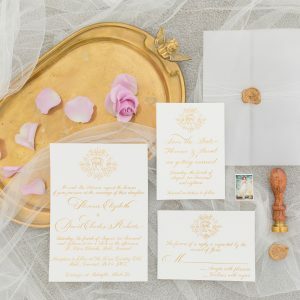 A vellum wrap or cover can be printed, foiled, written on or finished with a wax seal or twine, a wonderful effect where you can just see the invitation sitting under the vellum – you can even have your invitations printed on them with a illustrated or watercolour painting underneath. I love to get out my watercolours and paint venues, flowers, crests in fact anything you would like turned into art to be a part of your special day. A watercolour envelop liner of your venue can be a wonderful way to invite your guests and also a beautiful taster of the beauty of the venue of your wedding. Creating special illustrations or sketches is a joy for me, whether it is a venue sketch or a botanical illustration. I will work with you to discuss your ideas and create a number of sketches which can then be scanned into the computer and converted to a vector graphic which can be used in any part of your design, whether for invitations, business branding or for special events.